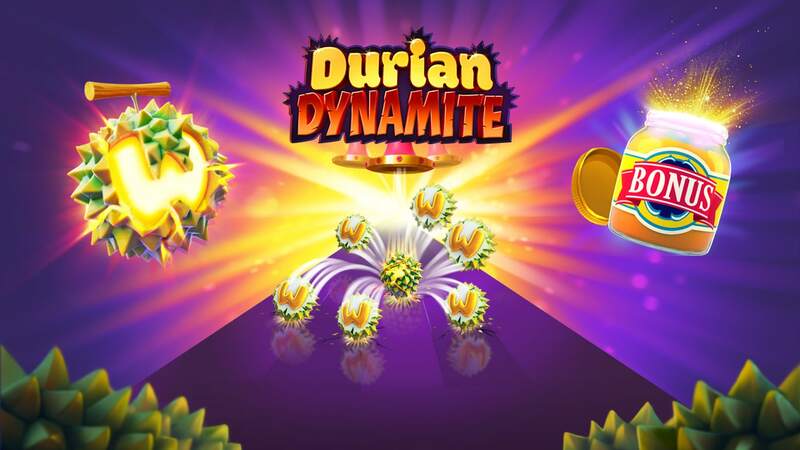 Durian Dynamite is the latest online slot game by Quickspin. And this game is now live. Durian Dynamite uses 20 lines and comes with a fruit theme. All symbols, including wild symbols, may appear stacked on all reels. The game uses several features, which I will explain point by point below. On the left of the reels you will see a supply of durian fruits. This is the number of fruits that will be thrown on the reels during a dynamite launch. Above the reels you see special shoots, one of them will be a different color during normal play, several can become active during free spins. Only on this reel a special Dynamite Wild may appear to trigger the Dynamite Launch feature. When a Dynamite Wild appears on a Dynamite Reel this feature is triggered. The special Durian Fruits on the left will be thrown randomly at the reels and where they land they will turn wild. If they hit a wild symbol already on the reels, it will explode and give two extra wild symbols, if one or both of these hit a wild symbol, they will explode again. This can trigger several times in a row, giving a lot of random wild symbols. Get all three bonus symbols on reels 2, 3 and 4 to start the free spins feature. You will receive 6 free spins. Before the spins begin you may pick the bonus symbol several times to get additional spins, additional durian fruits and/or additional Dynamite Reels. After the picks you might even get more picks at random. After this the free spins will start. You can’t win more free spins during the feature. Durian Dynamite is an amazing Quickspin slot game. Especially the free spins feature is exciting. If you get more than three picks you can really accumulate some nice extras. More durian fruits and more dynamite reels can give a lot of wild symbols when the Dynamite Launch feature is triggered during the free spins. Play this new game now at Leo Vegas or any other online casino offering Quickspin slot games. Like for instance also Betsafe.